The white wine, butter and garlic in this dish bring the mushrooms alive while the white truffle oil deepens and intensifies their flavour. Never wash mushrooms as they are porous and will absorb the water. Just wipe them with a cloth to remove any dirt. Boil some new potatoes in salted water. When they are cooked through drain and allow them to cool slightly before slicing and laying them on a bed of salad leaves. Sprinkle the potatoes with sea salt. Next melt a knob of butter in a frying pan then sauté a selection of good mushrooms, roughly chopped with little ones left whole, with a sliced garlic clove for about 5 minutes. Add a slosh of white wine and reduce down until it disappears completely. Season right at the end – if you add salt at the beginning it will draw out the juices from the mushrooms, which you don’t want. 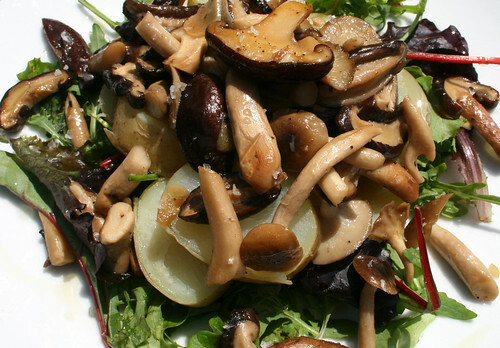 Top the salad with the mushrooms and drizzle over some white truffle oil.